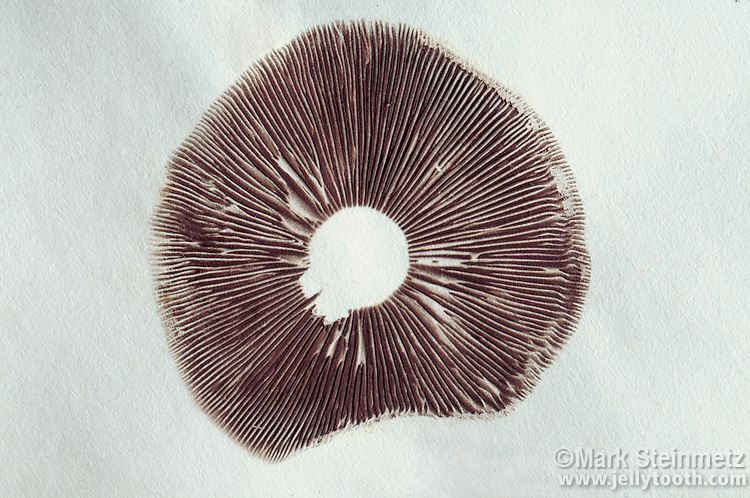 Spore print of a gilled mushroom. To obtain a spore print, the stem of a mushroom is cut at the base of the cap, which is then placed horizontally on paper. Overnight, millions of spores may drop from the gills and thus be closely examined. Spore color is often an important identification characteristic. The dark purple-brown color of the spores of this individual helps to comfirm it is a Brick Cap mushroom (Hypholoma sublaterititum).